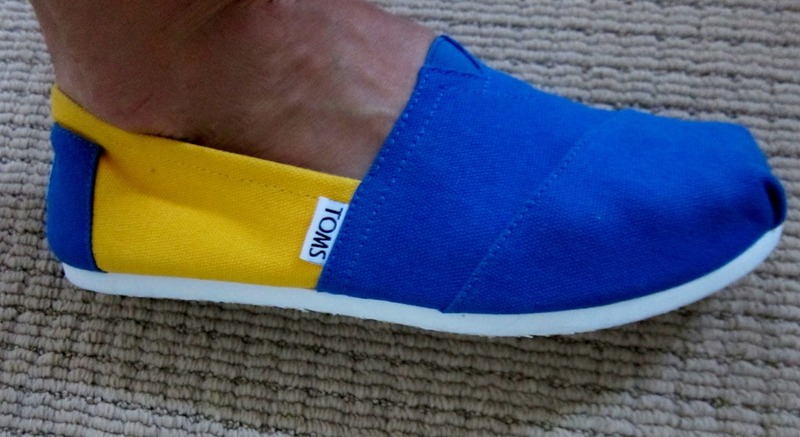 It’s celebrate college colors day, so I decided to break out my new UCLA Toms and sports some yellow and blue! Since it’s the last weekend before labor day, I also decided to wear my white skinnies. Any exciting plans for the weekend? I’m ridiculous excited to celebrate my sister’s 21st birthday!! It’s been awhile since I’ve had a chance to blog, but luckily I’ve still been snapping a few outfit shots. Here’s a catch-up of my more work-related outfits. I love sheath dresses. They’re so versatile, and can easily be dressed up or down. I paired this simple black sheath with a leopard print scarf and black heels. I posted about my yellow bubble necklace here, and I decided to wear my black one to work with a blazer. Ankle pants, heels, and a blazer dress up a simple white tee. I love pink and was so upset when my hot pink J Crew skirt ripped, that I was lucky to find this option at the Nordstrom Anniversary Sale. Can’t wait to pair it with black tights for fall! Bubble necklace take 2! This time I dressed up my chambray shirt with a black pencil skirt, heels, and my black bubble necklace. 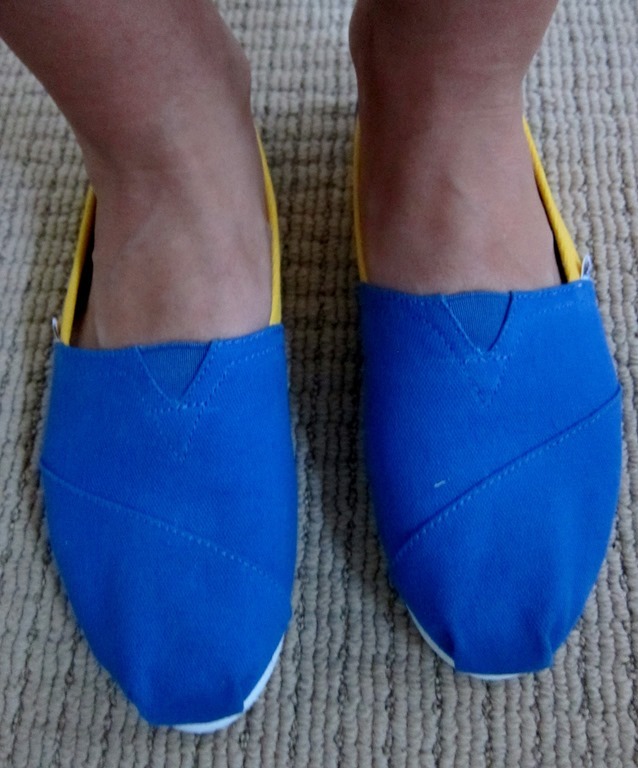 I was ridiculously sad about these shoes. I wore them for one day/night, and the soles started falling apart! Super surprising for Cole Haans! Luckily, they were purchased at Nordstrom, so I was able to return them. Well, there you have it! 5 work outfits for catch-up! Red, white, blue, and pink! I hope everyone had a fabulous independence day! I celebrated with my sister, family, and friends, and incredible Seattle weather. 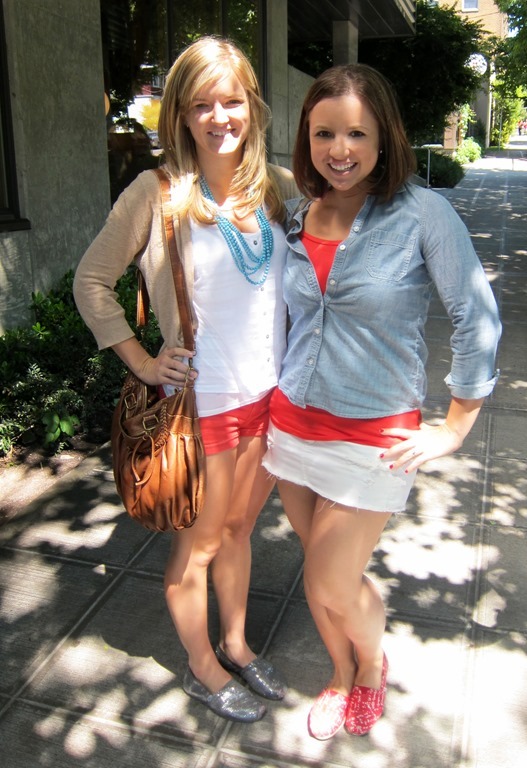 My sister and I both paired versions of red, white, and blue. I wore a white denim miniskirt, red tee, chambray top, and my red calculus toms. 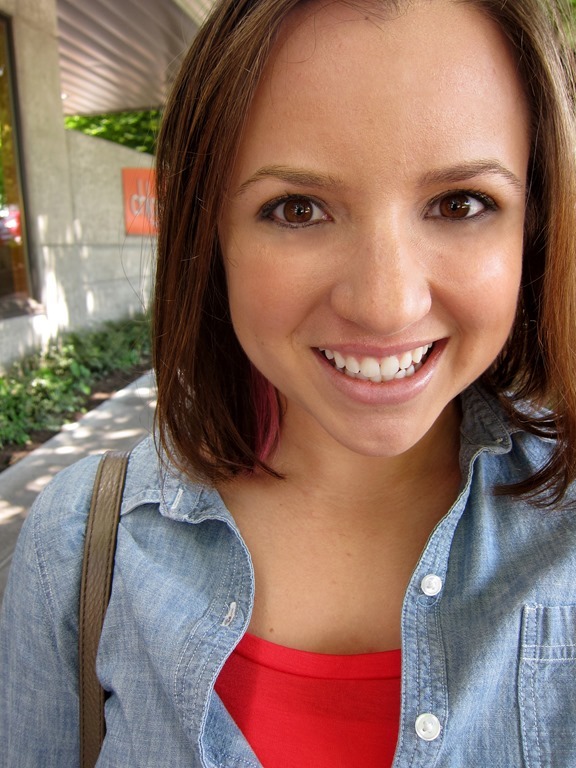 She paired a turquoise necklace with a white tank, coral red shorts, and sequin Toms. First, my sister and I started off the day by getting our hair done. 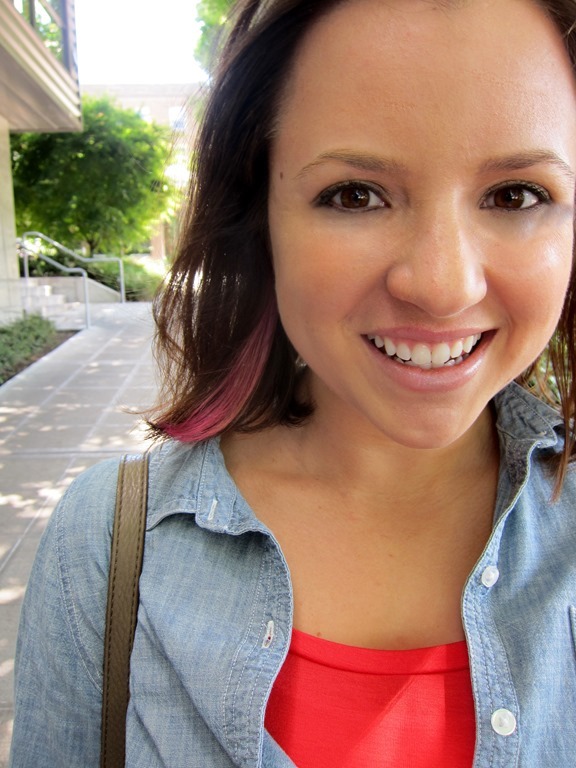 I got it cut and colored, and then decided to do something I’d been wanting to try for a year: I added a pink streak! It’s on the underlayer, so it’s hidden in most cases, but then it pops out as a fun burst of color. I love it! We then enjoyed lunch at Skillet, I spent a few hours laying out on our deck, and then we had friends over for drinks, bbq, and sunshine! We coordinate even when we don’t try!! The Perfect Travel Bag – and a Braid!